These French Fridays are getting easier and easier. 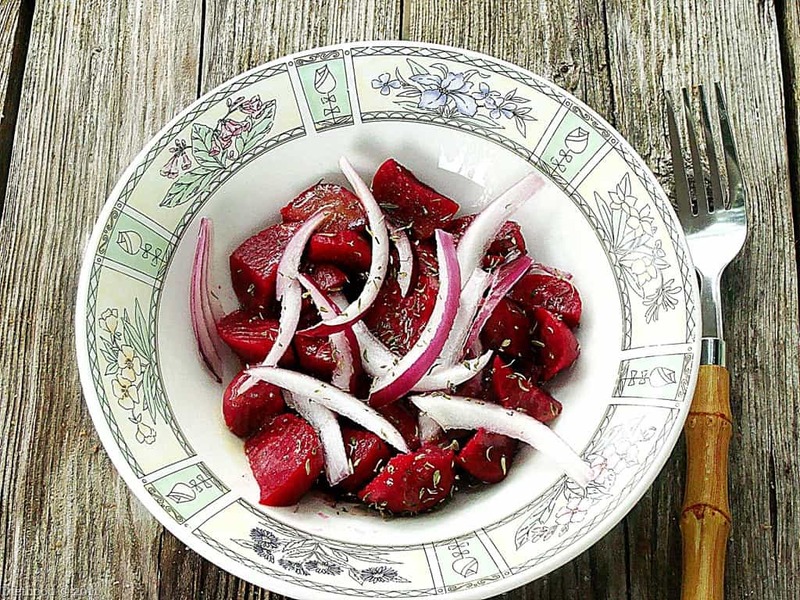 This is another simple, delicious, summery salad that you can add to your repertoire, given that you love beets and raw onions. I’m not a fan of raw onions, but the rest of the salad was really good. What’s better about this salad is the vinaigrette! Sherry vinegar, honey, dijon mustard – it is delicious! I tossed in some thyme, scattered the iced red onions on top, and served it as a side salad with our dinner. The participants of French Fridays with Dorie do not share the recipes. Instead, we encourage you to get the book, Around My French Table, and join our club! I love beets and I love the vibrant colors of this salad…gorgeous! I could eat beets every day, so yeah…this looks great to me! Oh that is awesome!! I am looking forward to seeing it! Simple, beautiful and loaded with flavour and nutrients – lovely! So pretty! The vinaigrette sounds like it would be wonderful! I’m not a huge fan of raw onions either but I think they might be just right when combined with the beets. Lovely!! Just getting around to liking beets, Kate and not a huge fan of red onion but this looks rather lovely. The vinaigrette sounds like a winner and I’m thinking the thyme makes the beet come alive. Love the beautiful colours! I love this! 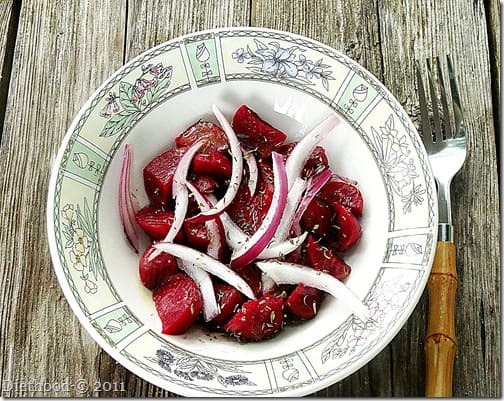 Beets are a staple in my diet, and your preparation of them is beautiful! Everyone’s french friday posts look amazing! I’d make this just for the look of it. Make it a center piece of something. lol. Gorgeous! If you slice the onions really really fine it works better if you are not a fan. Also, I liked Dorie’s tip about soaking them – it really did remove the bitterness. After seeing this I so want to get up early and go to the Farmers’ Market in the morning. Great looking salad! Love beets, and I am sure this tastes great! Great post! I love beets and this salad is gorgeous!! It screams, “summer is here!” Have a happy July 4th! This looks amazing! I love beets, ate tons of them when I was a kid :). Oh that looks great. I never think of preparing beets but it is really nice cold in a salad once cooked. The colors are stunning and the seasoning great. I love beets! Your salad looks cool and refreshing for a hot summer day. I did add goat cheese to mine; I couldn’t resist. Great job Kate! Your onions stayed white! 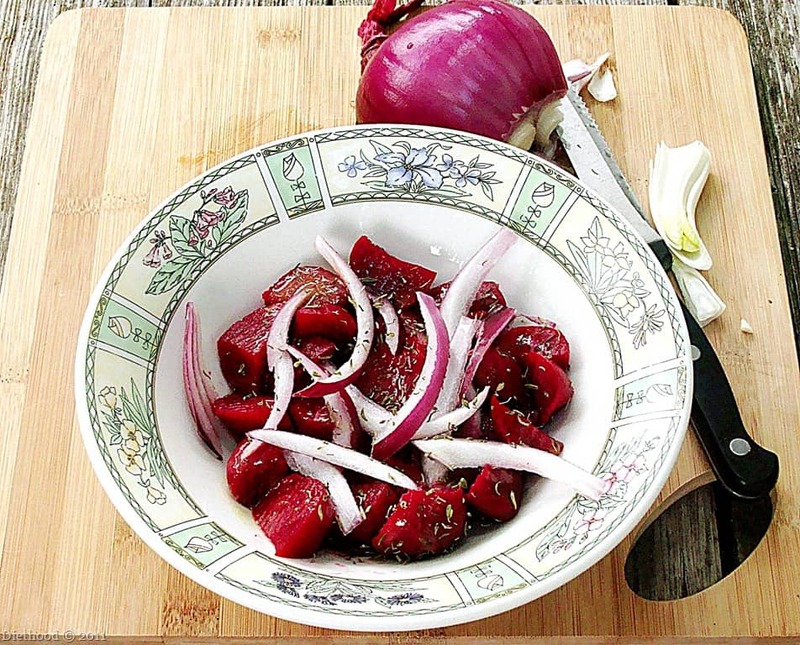 Mine turned red immediately…..but I love this salad and the icy onions. I’m surprised at how many people don’t like raw onions. Hmmm. I was given a batch of beets from a friend’s garden and they may just have this recipe’s name written all over them. I love raw onions too. Your salad is very enticing! I just can’t bring myself to eat beets…and I’ve tried. More than once. I do love the dressing though! Those flavors sound fantastic. Have a great 4th of July Kate! Sometimes when I don’t feel like adding onions but kind of have to, I slice them paper thin. They are not as overwhelming as the larger slices. Your salad looks delicious! This looks so good!!! I am a big fan of simple, delicious, summery salads!